Ship Weight : 10.72 lbs. 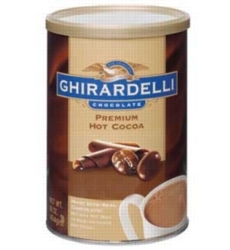 Enjoy the legendary taste of Ghirardelli Chocolate with each sip of their Premium Hot Chocolate. Ghirardelli uses only the finest ingredients such as cocoa, unsweetened chocolate and real vanilla with a note of coffee to create this rich, creamy flavor. Just add milk!